American Society of Clinical Oncology Names Immunotherapy "Cancer Advance of the Year"
"There are not a whole lot of patients that are able to do something like this, so we were doing it for them as well," says Chuck Wakefield. "It meant so much to them to have their names on the banner." Failure has never been an option for Bob Dickey. He underwent a stem cell transplant in July 2011 to treat his multiple myeloma and described the experience as "21 days of getting beaten with a baseball bat." But he didn't let pain or fear hinder his resolve. "Of course I didn't like it; I didn't want to do it," says Dickey, 48, from Shell Beach, California. "But what was I going to do — not do it and probably not live that long? That really wasn't a choice. So I just took it in very short increments of time. I used to stare at the clock and just will myself to get through 15 more minutes, and then when those 15 minutes passed I'd will myself to get through the next. I just stopped thinking about even the possibility of failure." It is with that attitude that Dickey, along with 14 other like-minded multiple myeloma patients, caregivers, supporters, doctors, and others connected to the disease, took an 11-day journey in January to climb Mount Kilimanjaro — the world's tallest freestanding mountain located in Tanzania — raising almost $250,000 for the Multiple Myeloma Research Foundation (MMRF). "To me, the day we climbed to the summit felt a lot like going through the stem cell transplant, in that we just didn't have a choice, we had to keep going even though the conditions were worse than expected," says Dickey. "I just kept telling myself that day that I wasn't put in that position to fail. I 110 percent believed that I could not fail. Because I truly believed that, then I just had to take one step at a time until I made it to the top. I knew it was going to be bad, but I also knew what bad felt like and that I could handle it. I just had to do it and not think about how hard it was." The idea to climb Mount Kilimanjaro as a fundraiser for multiple myeloma research and awareness came from Jamie Slater, 40, from Brooklyn, New York, who has lost many family members to cancer. She had always dreamed of climbing Mount Kilimanjaro, but wanted to do it for something bigger than herself. It was her friend Stan Wagner, a 61-year-old multiple myeloma patient also of Brooklyn, who suggested that MMRF — which budgets 90 percent of all funds raised for myeloma research and related programs — may be a worthy benefactor. Thrilled with the idea, Slater connected with Alicia O'Neill, the Director of Business Development and Partnerships for MMRF Events, hoping that she could help her recruit participants. O'Neill's reaction was surprising. "Jamie called me and asked if I could convince others from MMRF to do this and I told her not only could I do that, but I wanted to do it myself," says O'Neill, 56, of Stamford, Connecticut. "I agreed right there on the phone to join the climb; it is something that had been in the back of my mind for 30 years." With O'Neill, Wagner, and Slater already on the team, it soon expanded to include multiple myeloma patients Dickey, Chuck Wakefield, 68, from Dallas, Texas; and Jeff Goad, 55, from Chicago, Illinois. Goad's wife Ramona Biliunas, 50, also joined the team, along with Colleen Smithson, 27, from St. Louis, Missouri; Julie Ryan, 44, from Camas, Washington; Jana Cannon, 44, from Camarillo, California; and Mark Harder, 50, from Chicago, Illinois — all who currently have a family member with multiple myeloma or have lost a loved one to multiple myeloma. Brian Berryman, 47, a multiple myeloma specialist at Baylor University Medical Center, in Dallas, Texas, also joined the team. Berryman is the physician of team member Wakefield and also lost his own mother Mary France Berryman to multiple myeloma in 1997. It was her battle with the disease that inspired him to become a multiple myeloma specialist. MMRF supporter, Jeff Levine, 37 from Rockville Centre, New York, also joined the team. Initially, each participant had to commit not only to raising at least $10,000 each for multiple myeloma research (a goal they all exceeded), but to paying the $6,000-plus cost of the trip itself. But that burden was lifted after Takeda Oncology — the company developing the multiple myeloma drugs Velcade (bortezomib)‎ and Ninlaro (ixazomib) — got involved. Thanks to that sponsorship, as well as the sponsorship of other organizations, the travel and expenses of the climb itself were covered for all participants, allowing the climbers to focus on fundraising. To show even more support, Ryan Cohlhepp, Takeda's Vice President of U.S. Oncology Marketing, joined the climbing team, and personally raised over $40,000. "This climb symbolizes so much of what we are trying to accomplish as a company with our aspiration to cure cancer," says Cohlhepp, 39, of Westborough, Massachusetts. "When they were looking for volunteers, I knew I had to do it." 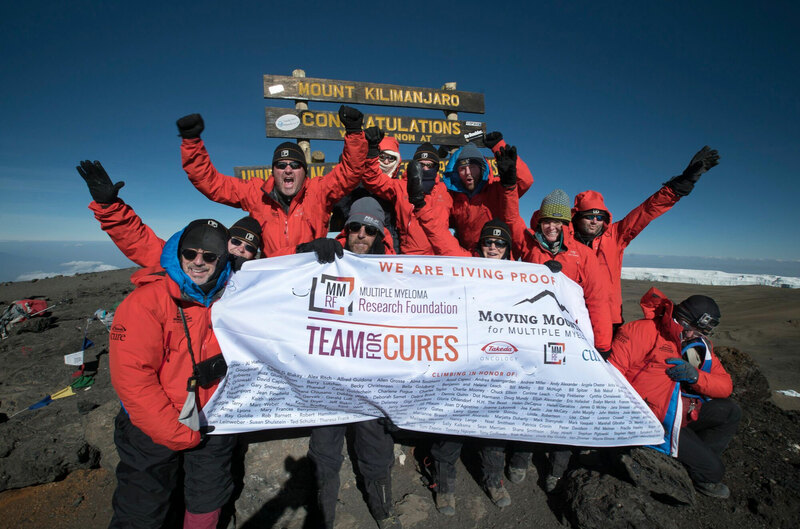 CURE also served as a sponsor for the climb, which became known as the "Moving Mountains for Myeloma" initiative. CURE's Director of Patient Education, Marty Murphy, 47, from Raleigh, North Carolina, became a member of the team — bringing the total to 15. Three photographers and videographers also accompanied the team to document their journey. While most of the team had some experience with extreme activities — Wakefield does long-distance cycling, O'Neill has run 10 marathons and Dickey had previously climbed Mount Whitney as a fundraiser for MMRF — none were fully prepared for the physical and mental challenge of climbing a 19,341-foot mountain. "It was much harder than anything I could have imagined, and every single person on the trek said the same thing," says O'Neill. "This was the hardest thing that we had ever done." The team faced daunting challenges including subzero temperatures, torrential rain, and 50 mph gusts of wind. "Some days were really tough," says Cohlhepp. "One of the days that stands out to me is when got caught in a really bad rainstorm and we were just so wet and cold and coming into camp we were all kind of thinking, ‘Why the heck did we sign up for this?' This was a low point." Members of the team also suffered from numerous health issues including altitude sickness, dehydration, and extreme exhaustion. One member of the team ran a fever of 102 and another went temporarily blind from the altitude. Dozens of Tanzanians accompanied the group, serving as guides, porters, servers and cooks. Every person received a medical exam morning and evening to make sure they were healthy enough to continue on. "No matter how fit you are, no one knows how the body is going to work at altitude," explained Wakefield. "My mouth was so dry; we were so dehydrated. I didn't have an appetite. You are so messed up in terms of being hydrated and having the right amount of food. I lost 5 pounds." The day that the team hiked to the summit proved to be the most challenging. In order to arrive at the summit around sunrise, they had to start hiking at 11 p.m., when it was bitter cold, dark and extremely windy. At times, many team members felt it would be impossible to make it to the top, according to O'Neill. "On the night we summited, we had to have a very strong mental attitude and be sure, we wanted it bad enough to work through pain and discomfort to get to the summit with our fellow team mates," says O'Neill. "It was surprising that we could power through the night, through fear, through discomfort, and lack of sleep." It took nearly nine hours to hike to the summit from their camp site. For most of the hike, the team was silent, each focused on simply putting one foot in front of the other. The natural beauty around them was incredible, according to Wakefield. "When the sunrise started you could see it on the entire horizon. There were layers of orange and blue and pink across the whole entire horizon," he said. "I don't even remember the cold and the wind, but I remember the sunrise and the moment that we first saw the top of the mountain." Each person had their own summit task. Wakefield took photos with trinkets and toys his grandchildren had asked him to bring to the top, while Berryman secured ribbons from military serviceman under rocks. The whole team took a photo in front of a banner with the names of multiple myeloma patients as well as those who had lost their battle with the disease. "There are not a whole lot of patients that are able to do something like this, so we were doing it for them as well," says Wakefield. "It meant so much to them to have their names on the banner." Four members of the team were not able to make it to the summit due to health issues. While this was sad, the summit itself was not what made the journey significant, says Dickey. "The whole climb was bigger than the summit. The summit was just a symbol of success, but in reality it doesn't signify success," he says. "I think success was a lot of other things around the way; the relationships that we formed that will go on far past the summit, and the impact we were able to make though fundraising." Most of the team members did not meet until a few months before the climb when they gathered in New Jersey for a practice hike. Yet despite being virtual strangers before the climb, many became close friends. "It escalates friendships a lot when you are on a mountain at 15,000 feet," says Cohlhepp. "To get to go with 14 team members and get to know and understand their stories and how their lives had been impacted by myeloma was amazing." Dickey says the four patients on the trip, himself, Wakefield, Goad, and Wagner, immediately bonded. They discussed their experiences, and he was surprised by how different each person's cancer journey had been. He also was touched by the support of the patients from the non-patients in the group. "I was taken back a few times by people that would say very kind and encouraging things about how it meant a lot to them that us patients were there and we were giving it all we could, because that translated in their lives as hope for their loved one that had multiple myeloma," he says. "I didn't see us like that. I saw us the same as Marty or Ryan or anyone else; just people trying to make it to the top and raise money for this disease." Research funding for multiple myeloma is desperately needed. But significant progress has been made in recent years. "Our sole purpose at MMRF is to fund and oversee research that gets these drugs through the pipeline faster so the patients can benefit. It usually takes 10 years for one new drug to come to market, and now we've had 10 drugs in 12 years. Last year alone, four new drugs came to the market. The life expectancy of the average patient is now nine or 10 years and maybe by then we will have a cure; it may be a manageable disease. There is a lot of hope, and it is hope based on progress," O'Neill says. Multiple myeloma doesn't have be all-consuming, he adds. Dickey hopes that others are inspired by his climb of Mount Kilimanjaro to do whatever they set their minds to, with or without multiple myeloma. "Your life doesn't have to be all about your next doctor's appointment," he says. "Don't reside yourself for that, strive for the things you wanted before the disease. I have never been more optimistic about anything than I am about this. Multiple myeloma is considered incurable, but the way I see it, it is a lot more manageable than it used to be." "We don't talk about months or years of survival anymore; we talk about decades."